News that North and South Korea have agreed to reopen the Kaesong Industrial Complex is making the rounds in mainstream media around the world, and the latest reports have made it apparent that agreement about the use of modern digital communications and the internet are at the center of discussions about stabilizing and globalizing the complex. This is not at all surprising. When originally established, the Kaesong Industrial Zone was located just across the DMZ north of Seoul, and close to the new Incheon International Airport and the nearby "ubiquitous networked city" of Songdo. 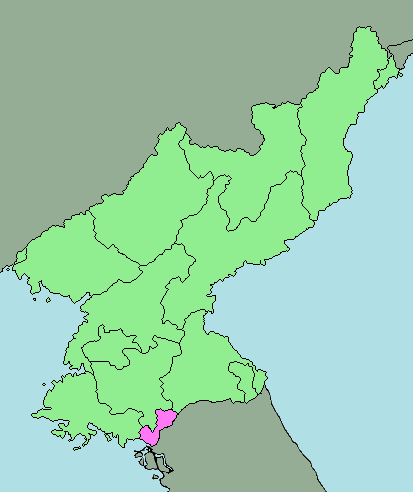 The Zone is shaded in pink on the accompanying map (source: Wikipedia, click on the map to see a full size version) This choice of location was deliberate as the Incheon area was planned for development as a large seaport, airport and teleport complex. In addition to the main issue of guaranteeing the safety of South Korean workers who enter and sojourn in the Kaesong complex, North and South Korean representatives are reportedly discussing internet access, mobile communication and the introduction of an RFID (radio frequency identity tags) entrance system for the complex. According to The Hankyoreh,"In terms of mobile communication such as cell phones, one remaining technical problem is how to bridge the gap between the Orascom mobile communication method used in North Korea and the mobile communication method used by South Korean companies such as KT Telecom and SK Telecom." 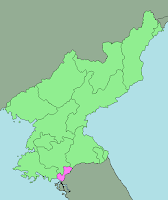 Finally, it is striking that the Kaesong Industrial Region anchors North Korea's side of the DMZ in the West, while the Diamond Mountain resort complexes, also operated by Hyundai Asan, are just north of the DMZ on Korea's east coast. It is more than mere coincidence that, in the current North-South negotiations, success with the Kaesong complex has been linked to discussions about reopening tours to Daimond Mountain. Even without any agreement on co-hosting certain events in the Pyeongchang 2018 Winter Olympics, Diamond Mountain tours and skiing at the new Masik ski resort in North Korea could be expected to thrive in conjunction with the Olympics.